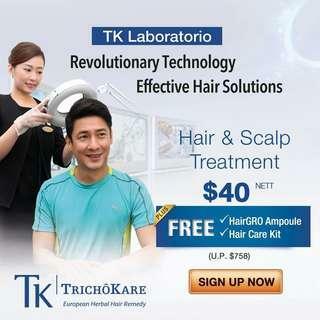 Free $20 NTUC vouchers upfront @Trichokare’s Carousell special $40 hair treatment. Save your hair today! 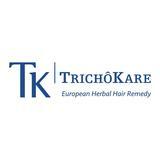 Special April Promotion with TK Trichokare! 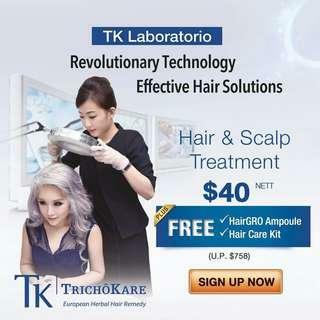 Award-Winning Hair & Scalp Treatment @ $40 nett with FREE HairGRO Ampoule + Hair Care Kit (worth $758). Get S$20 NTUC voucher while saving your hair by signing up with us today! Helps to cleanse the scalp gently and eliminates hair problems. Regular use helps to restore vitality and gloss to the hair. A dynamic all-in-one conditioner that repairs damaged hair, improves strength and elasticity of hair, making hair more manageable and silky smooth. Enriched with Panthonel (Provitamin B5), Red Tea, Argan oil to strengthen hair, prevent breakage and deep moisturise your hair. Enriched with Vitamin E and botanicals, Revitalizing bath is formulated for regular use to help the scalp restore its balance and moisture, condition hair while removing grease and leaving hair feeling refreshed after each use. Black Shine is rich in variety of vitamins and proteins. Blended by a Trichologist, it helps to moisturise, restore hair hydration and keeps your hair looking healthy and full of vitality. Use regularly for more manageable hair. Hair Coat is used for dry, brittle split ends. It helps to seal the natural moisture and nutrients in hair strand, coat the outer layer of hair cuticles, and repair damage cuticles. Effective after the first application. Regular use will ensure soft, smooth and glossy hair.